Chicago-based guitarist Melvin Taylor is a star in Europe, but it may take some time for U.S. audiences to catch on to just how phenomenally talented a bluesman he is. Part of the problem for Taylor may be his own natural eclecticism. 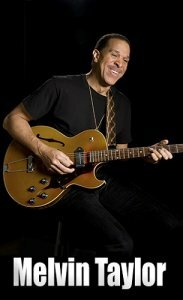 He's equally adept playing jazz or blues, but in the last few years, he's forged a name for himself as a blues guitarist with a slew of releases for Evidence Music. Taylor may well be the most talented new guitarist to come along since Stevie Ray Vaughan.